Reacts with a protein of 57 kDa, identified as the L1 protein of human papilloma virus type 16 (HPV-16). It is the major capsid protein of HPV-16. Infection with specific types of HPV has been associated with an increased risk of developing cervical neoplasia. HPV types 6 and 11 have been associated with relatively benign diseases such as genital warts but types 16 and 18 are strongly associated with cervical, vaginal, and vulvar malignancies. The antibody reacts very strongly with formalin-fixed, paraffin-embedded tissues containing HPV-16 or -33; very weak reactions were occasionally observed with biopsy specimens or smears containing HPV-6 or HPV-11. It cross-reacts with HPV37. 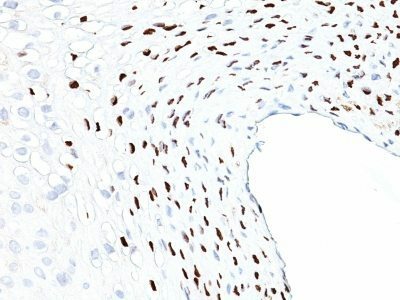 Catalog number key for antibody number 1058, Anti-Human Papillomavirus-16 (HPV16/1058) The prefix indicates conjugation, followed by the antibody number and size suffix.